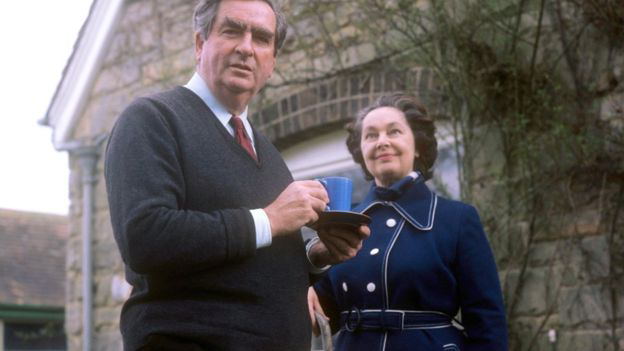 Former chancellor Denis Healey has died at the age of 98, his family has said. Lord Healey was Labour's defence secretary from 1964 to 1970 and chancellor of the exchequer from 1974 to 1979 before becoming deputy party leader in opposition in 1980. The former Leeds MP's family said he died peacefully at his Sussex home on Saturday, after a short illness. Labour leader Jeremy Corbyn said he was "a Labour giant". The PM said he was a "huge figure of post-war politics". BBC political correspondent Iain Watson said Lord Healey's death marked the end of an era in Labour's history. Mr Corbyn tweeted: "Denis Healey was a Labour giant whose record of service to party and country stands as his testament. All our thoughts are with his family." Shadow chancellor John McDonnell said he was "absolutely loyal to the Labour Party" and a "towering intellect". Prime Minister David Cameron wrote on Facebook: "We've lost a huge figure of post-war politics. A hero in World War Two as Beach Master at Anzio and a brave politician, Denis Healey told his party hard truths about Britain having to live within her means." Lord Healey served as an MP for Leeds for 40 years from 1952 before joining the House of Lords in 1992. A defining moment in his career came in 1976 when, as chancellor, he applied for an emergency loan from the the International Monetary Fund in an effort to save the pound from collapse. He came close to winning the Labour leadership in 1980, finishing just 10 votes behind winner Michael Foot. A graduate of Oxford university, he also served in the Army, joining operations in North Africa, Sicily and Italy during World War Two. His wife, Edna, died in 2010. Denis Healey, an intellectual heavyweight who had a range of interests that stretched far beyond the narrow world of Westminster politics, was known for his tough, no-holds-barred style of debate. His relish for the cut-and-thrust of politics served him well during long periods in government in the 1960s and 1970s, and in the internal struggles that re-shaped Labour during its years in opposition in the 1980s. His trademark bushy eyebrows, colourful turn of phrase and expertise on a range of musical instruments, including the piano and double bass, made him a regular fixture on television and a favourite target of impressionists. But he had a sharp mind and could fell opponents with a devastating one-liner, once likening debating with Conservative Chancellor Geoffrey Howe to being "savaged by a dead sheep" and accusing Margaret Thatcher of "glorying in slaughter" during the Falklands conflict. Former Prime Minister Tony Blair said Britain "has lost a dedicated and faithful public servant". Mr Blair said: "He steered the Labour government and the country through some of the most difficult economic times; and in winning the deputy leadership of the Labour Party in 1981, he probably saved the Labour Party as an instrument of government and social change. "All of us in the Labour Party owe him a huge debt. Britain has lost a dedicated and faithful public servant." Shadow foreign secretary Hilary Benn, whose father Tony unsuccessfully ran against Lord Healey for the party's deputy leadership in 1980, said: "Very sorry to hear that Denis Healey has died. All our thoughts are with his family on their loss. 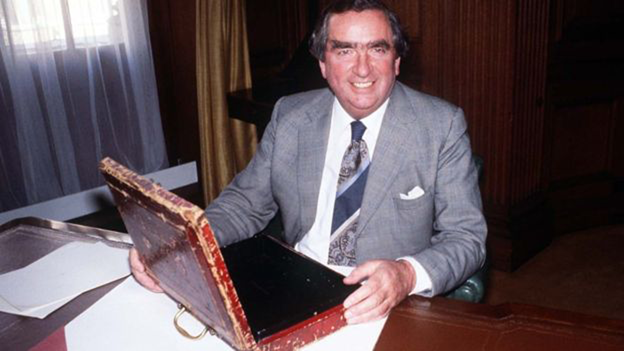 Current Chancellor George Osborne tweeted: "Sad to hear that Denis Healey has died at 98. A giant of the Labour movement + Chancellor in the most difficult circumstances." Labour's leader in the Lords said Lord Healey, pictured with his wife Edna, was said to be a "real character"
Scottish First Minister Nicola Sturgeon tweeted: "Very sorry to hear that Denis Healey has died. He was, undoubtedly, a giant of the post war Labour movement. Condolences to his family." Labour's leader in the House of Lords Baroness Smith of Basildon, said: "Denis was a great man of British politics and a real character with a tremendous sense of fun. "He maintained his passion and commitment and all of us in the Labour peers group will miss him so much." Former Labour cabinet minister Peter Hain told the BBC Lord Healey was "an enormous character" who had a "wonderful sense of humour". He said: "His passing, very sad, is part of a passing of a Labour era those big figures in the Labour party."